As you may or may not know, squirrels have it out for me. It started when I stopped putting Skippy Chunky Peanut Butter on my fence and the rodent retaliated by trying to make off with my thong. (You can read all the details in my upcoming book by SWM Press – The Squirrel Stole My Thong And Other Reasons I’m Still Single.) 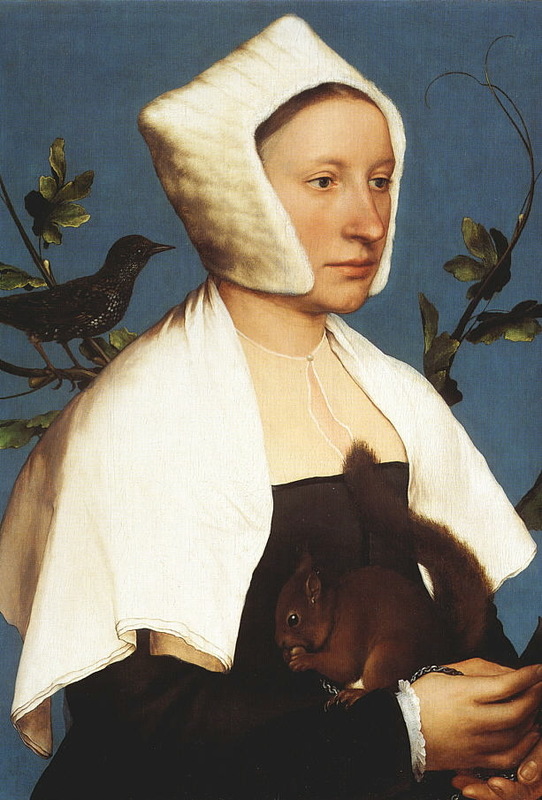 I see that squirrels have been cozying up to humans, trying to gain their trust for centuries as the painting by Holbein illustrates. However it also shows another sinister presence lurking in the background – the crow. Do crows have it out for me? No but evidently they have it out for my sister and now my cat. Granted, she would gladly kill it and eat it if she could. She already stalks, kills and eats any flying insect that manages to get into the house. However this one crow has been tormenting her for the past week and I wonder if it’s the crow she lunged at nearly a fortnight ago. My sister has informed me that now only is a crow stalking her because she screamed at it but it has enlisted it’s friends to torment her as well. Needless to say, I thought she was sniffing mimiograph paper again. However she pointed to a scientific study that suggests crows not only can identify people who piss them off but can spread that information to other crows and enlist their help in tormenting their tormentors. Say that three times fast. This study was reported in the New York Times so I have to give it some credence. I mean, it wasn’t the National Inquirer or the Daily Mail. http://www.nytimes.com/2008/08/26/science/26crow.html Now this study doesn’t go into feline recognition but considering Dr. Marzluff’s findings, I’m willing to make the leap. Fortunately, I’m on the birds good side and intend to keep it that way. Having a rat in a stylish fur coat after me is enough for this lifetime. I guess my cat and my sister are on their own. Posted on May 9, 2011, in Uncategorized and tagged crows, holbein, paintings, recognizing human faces, squirrel. Bookmark the permalink. Leave a comment.